What is National Register of Citizens ( NRC ) ? The National Register of Citizens (NRC) is the register containing details of all Indian citizens. After conducting the Census of 1951, the National Register of Citizens (NRC) was prepared by recording particulars of all the persons enumerated during the 1951 Census. As per the directions of Government of India, this document was kept in the offices of Deputy Commissioners and Sub Divisional Officers and was later transferred to the custody of Police department in early 1960. 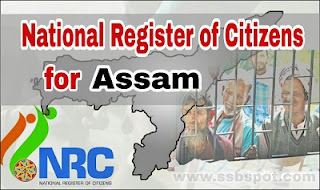 Assam happens to be the first Indian state where the NRC is being updated after 1951. 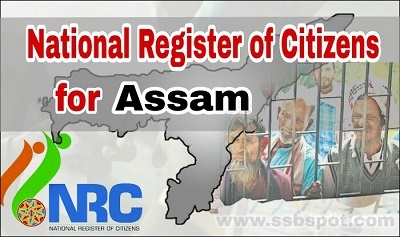 The final draft of the National Register of Citizens was published on 30th July 2018 in Assam, identifying 2.9 crore people as valid citizens of India. A total 3,29,91,384 people had applied to become part of the NRC. More than 40 lakh people were found to be invalid citizens of India, who have not been able to provide requisite documents as proof of their citizenship, have been rendered stateless,. Those not on the lists also include 2.48 lakh Doubtful-voters (D-voters) and their siblings and descendants. 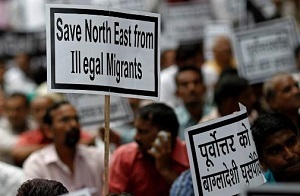 The Registrar General of India, Mr. Sailesh has informed that those who do not find their name in the final draft of the NRC, can file appeals by 30 September 2018 and prove their Indian nationality by providing documents – until then, no one will be declared an illegal migrant. Right from the British era, the poor peasants from East Bengal ( now Bangladesh) started drifting for better opportunities to Assam and West Bengal. As Assam, the north area of Brahmaputra River is well endowed with natural resources like oil, natural gas and Assam tea. The original inhabitants of Assam feel that they have been marginalized by the illegal migrants from Bangladesh, who have over stayed their hospitality and asserted their rights over resources that rightfully belong to the indigenous population. Problem got aggravated in 1971, when the Government of India decided to open the floodgates for refugees seeking asylum in India from Bangladesh, before its separation from Pakistan. Nagaland was carved out of Assam in 1963 and Arunachal Pradesh and Mizoram became UTs in 1972 and assumed Statehood in 1987, Meghalaya was formed in 1972 to accommodate territorial aspirations of Nagas, Khasis, Mizos and Garos, respectively. Consequently, Assam has seen a number of clashes between the original inhabitants and the outsiders on territorial issues. The worst was the one that happened at Merapani, Golagahat, when 70 Assamese were killed in 1979 and 50 died during the clashes in 1985. In July-August 2012 violent Bodo-Muslim clashes led to the death of 103 and displaced 4.85 lakh people belonging to both communities. Also many agitations in Assam also became the root cause of the requirement of updating NRC for Assam. The updating of NRC will lead to identification of illegal migrants and the resources of the indigenous Assamese people will be rightfully secured. Assam will become violence-free as the question of illegal migrants would be resolved and work for development of the State can commence unhindered and without any fear of disruption. It will also help the state and centre government to carry out targeted Public Distribution of basic necessities and amenities to the deserving. Implementation of a number of very ambitious development projects in Assam and other North East states that are in the pipeline will need workforce. Providing work-permits to these illegal migrants can assure a readily available unskilled workforce at cheaper rates. The exercise is likely to cause severe inconvenience to common people. It is being reported that names of some individuals even within one family that are legal citizens, has not been found published in the final draft of NRC. The errors in exclusion and inclusion while the NRC is being updated owing to doubts over the credibility of 1951 census and the difficulties involved in proving an indigenous citizen could cause injustice to many people. There are already six detention centres for the D-Voters (Dubious Voters) in Assam located at Goalpara, Kokrajhar, Silchar, Dibrugarh, Jorhat and Tezpur. It will become a massive exercise for administration to accommodate a large number of illegal migrants after the NRC has been updated. India’s image in international arena could be tarnished as the status of these citizens would remain unsettled. Bangladesh is already struggling to accommodate a colossal influx of Rohingya Muslims from Myanmar; it is unlikely to accept any more illegal migrants from India.